This piece was first published in The Listener, 21 March 1957. Text © The Estate of John David Roberts. Reproduced with the permission of the William Roberts Society. 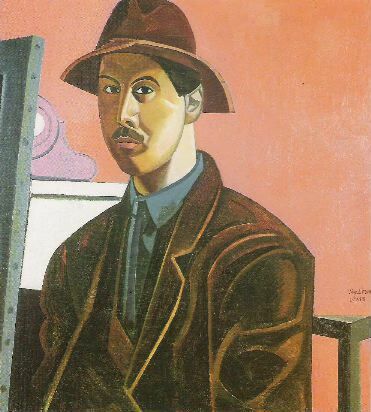 To reach the period of my friendship with Wyndham Lewis I must go back to the years that range from 1914 to 1920, to the years of the Vorticists and the first War Artists. When I think of Lewis it is not the blind and aged artist that I picture, for that figure I never knew, but a Lewis in his prime, alert eyed, with an assurance and provocative swagger in his bearing. And still today, across this long stretch of time, I always recall, as I pass down Fitzroy Street, where 'The Great English Vortex' was once so active, Lewis' tall form in heavy overcoat and grey sombrero, with scarf flung flamboyantly over one shoulder, striding along, the broad shoulders tilted slightly, like a boxer advancing to meet an opponent. In a sense, acquaintanceship with Wyndham Lewis was like a contest, in which you came out of your corner fighting  and the best man won. It was my association with Roger Fry and the Omega Workshop that drew the attention of Lewis in my direction, and which was also the reason I was invited one evening in the spring of 1914 to join him in an apéritif at the Swiss in Soho. Early in 1915 Lewis came to live at 18 Fitzroy Street, occupying the top flat in which Augustus John had begun his married life years before. Upon the landing, a relic of the past, still hung the gate put there to prevent John's children from falling downstairs. Lewis stayed at No. 18 until he joined the army at the end of the year. Vorticism had already begun some months earlier with the appearance of the first  magenta, puce, or pink  Blast, whilst Lewis was living in Percy Street. In his new residence, high up on the fourth floor, the paintings for the Vorticist show at the Doré Gallery were carried out; here much of his first novel Tarr was written  this bulky manuscript packed in a small attaché case accompanied him everywhere, to restaurants, even to the cinema. A second number of Blast  black and white  was published, and some last attempts made by Helen Saunders and Jessie Dismorr, with painted candlesticks and match-box- holders, to drive the Omega, round the corner in Fitzroy Square, out of business. Lewis' flat was the meeting place of the Vorticists; here we assembled on Saturday afternoons usually, about tea-time; Wadsworth, Etchells, Ezra Pound and the rest, together with others, supporters of the 'Movement', such as Ford-Maddox-Heuffer and Violet Hunt. A regular habitué was Guy Baker the possessor of a large collection of Lewis' drawings. Frequently these Vorticist teas would be followed by a 'Group' dinner, then the party headed by the flaming red-haired Ezra Pound would make for L'Etoile or L'Hotel de la Tour Eiffel. In my memory la cuisine Française and Vorticism are indissolubly linked. Both Signor Rossi of the Etoile, and M. Rudolph Stulik of the Tour Eiffel should rank in the records of Vorticism as honorary members of the 'Group'. Lewis who liked good food, and fine wine to go with it, kept a ringed serviette in each of these restaurants. If, as he claimed, Vorticism was the expression of a new philosophy, then it must be the newness of Rabelais, and of old Omar Khayyam's 'A jug of wine, a loaf of bread and thou beside me singing ' Nor was it developed in the gloom of a studio, but at the Tour Eiffel over a tourne-dos and a bottle of Burgundy. A Specialité de la Maison at the Tour Eiffel was a confection Stulik called Gâteau St. Honoré. This was a large circular custard tart ornamented round its edge with big balls of pastry. Lewis was very partial to this gâteau and always took a second helping; he excused himself one day for this by repeating the remark Schopenhauer is reputed to have made: 'If you thought as much as I do you would eat as much as I do.' Lord Kitchener's and Lord Derby's repeated appeals, backed by a couple of Zeppelin raids, made us realise a war was in progress and put an end for the time being to our art activities The Garrison Artillery claimed Lewis; I became a Field Gunner, and Stulik went to an internment camp. Thus ended Vorticism. After the battle interlude, the Eiffel again became our assembly point, but it no longer resembled La Nouvelle Athène of the Degas period; military uniforms and shaven chins had replaced the sombreros and beards. We were now Official War Artists. As a precaution against surprise night attacks from over-exuberant bohemians in uniform and their warrior companions, a small hole bored through the street door enabled Joe the waiter to inspect all late callers before admission. Lewis, who lived in Great Titchfield Street nearby, was a daily visitor to the restaurant. At this period, summer 1918, his novel Tarr was published. In the two large war paintings he did as an Official Artist, Lewis made no attempt to depict the war in a Vorticist or abstract manner. The second of these, 'A Battery Shelled', here reproduced, shows only a cubistic treatment of the figures and landscape. This picture was painted during the winter of 1918 in his new studio at Notting Hill. When Lewis began to tackle this large picture, he asked my help in transferring his design on to the canvas. To this I agreed. But my method of working did not satisfy him. 'You have photographed it on to the canvas,' he objected, adding: 'It looks like a Jacob Kramer!' Just how the slight pencil work I had done on the canvas could resemble a picture by Kramer and at the same time be photographic puzzled me. The painting was continued without my assistance. A few days later, when I called on Lewis, 'A Battery Shelled' was finished; it had been brushed in rapidly, Wadsworth serving as a model for the figures on the left of the scene. About 1920, following the swift collapse of Group X, Lewis, to use his own words, 'went underground'. Apart from a passing handshake at a chance meeting in the Lefevre Gallery in the summer of 1935, our paths never crossed again.